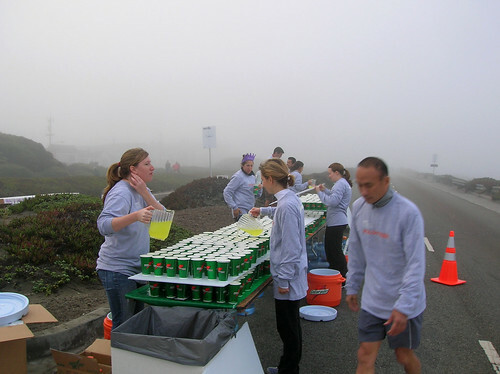 This is how long a typical water station during the 2009 Los Angeles Marathon. This was supposed to accommodate 12,000 runners for the Marathon distance. If there are 5,000-6,000 registered runners for the Marathon and other side-event races, then, at least, one half of this water station would be a typical water station for our Road Races in the country. The following pictures were linked by Ultrarunner Rick Gaston as part of the many Water Stations for the annual NIKE Women’s Marathon held in San Francisco where he is the Captain (In-Charge) in these Water Stations on the Mile-17 & 25. Thanks Rick for the pictures! This year I am returning as an aid station captain for the women’s nike marathon. I’ve worked the same post twice in the past. It’s a double aid station and I have a partner – one side is mile 17, the other side, on their return from a loop around a lake is mile 25. Each side has multiple tables for water and gatorade and the cups are 2 layers high, separated by plastic board. All this is meant for about 6,000-7,000 runners, more marathoners this year is expected. On my aid station I only see the full-marathoners. 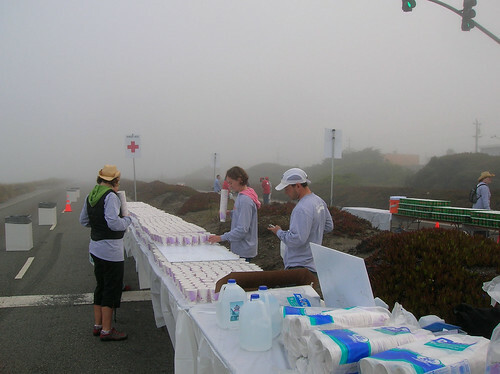 I’m assuming the aid stations leading up to 13-miles/21k are even more well stocked. in my experience, i find it important to have a water station at the finish line because i tend to push myself to the limit in the last km only to rush again soon afterwards just to look for water. 😛 it’s disappointing to see a long queue for water after you’ve just finished a race. Dear BR – I hope local race organizers will see the sense in the system you have posted and adapt it in the local scenario. All good things are worth emulating. No patent involve here!